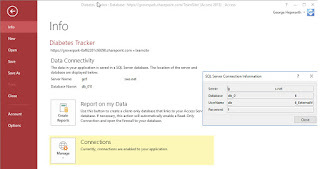 ... GPG On MS Access: Did I Mention I Have a Thing Against Lookup Fields in Tables? Did I Mention I Have a Thing Against Lookup Fields in Tables? Where do Lookup Fields in Tables Come From Anyway? Whether you consider them to be a useful idea or not, lookup fields in Access tables came from somewhere and we have to deal with them. My candidate for their dubious origin is SharePoint, but I have only a hunch. I know they were already in Access 2003, but I no longer have earlier versions of Access available and can't recall prior to that. (I'd appreciate being set straight on this point, if anyone knows more about it.) Suffice it say they made their way past the door wardens and are now firmly ensconced in MS Access tables, alongside the other dodgy characters cadging drinks from the regular patrons and whistling at the wait staff as they squeeze past to deliver the next round to the table behind. I want to be clear before we get into this in depth. 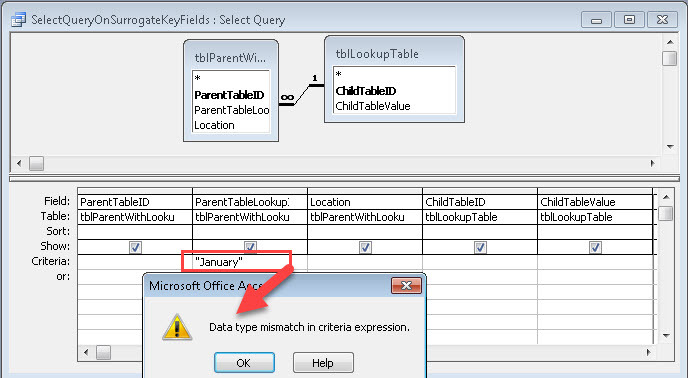 We are talking about lookup fields in tables. Combo boxes on forms work almost exactly the same way in some regards. They can also be abused in the some of the same ways. It's just that the more pernicious implementations I've seen were born in tables. What do Lookup Fields in Tables Do? The basic concept of a lookup field sounds pretty good -- at first look. Make it easy for users to see the values, not the foreign keys, for fields. 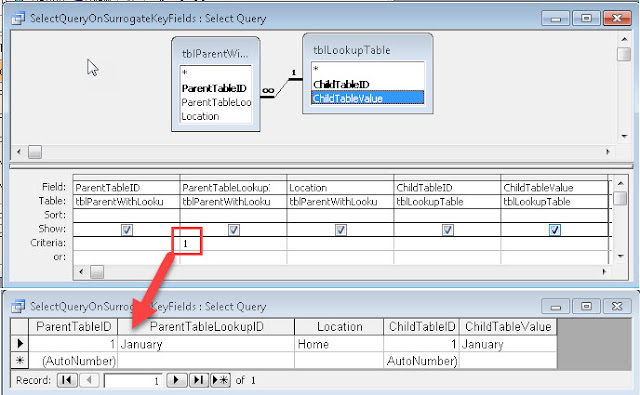 You have probably had the experience of opening a table and seeing columns of foreign key values in one or more fields. Trying to equate what you see there, e.g. CompanyID of 210, with the value to which that key value relates, i.e. "The Big Box Company", which is CompanyID 210 in tblCompany. 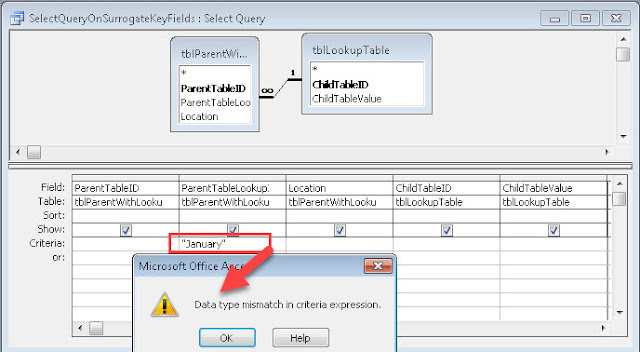 By converting the foreign key field to a lookup field, you magically allow users to see "The Big Box Company" even though the table stores Foreign Key 210. Done right, and fully understood, they can be benign and even handy for a developer. So far, so good. But like so many of life's little problems, it doesn't end there. Actually, more than you might expect. Here's an example of one of my least favorite attempts to use Look up fields in tables. Storing the Value, not the Key. This is the most common mistake I see. The best way to get to the point is with some images. 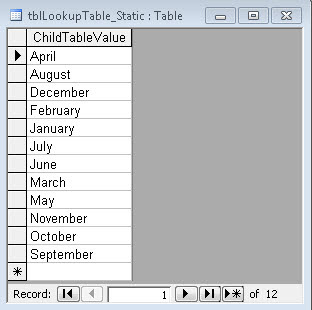 So, here's a typical Static Lookup Table. 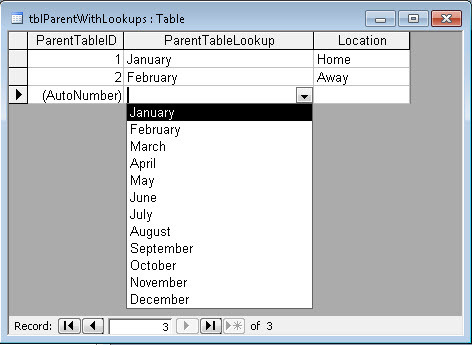 This table has a Primary Key and a Value field. Many Lookup Tables are like this. tblWorkDetail contains several other fields, including the start and stop times for the work, a description of the work, and the WorkID itself to which that detail relates. To select all work by date completed for an invoice, this list needs only the relevant dates, grouped on Date. Selecting one date from the combo box adds all of the work for that date to an invoice. Double duty. But I digress. 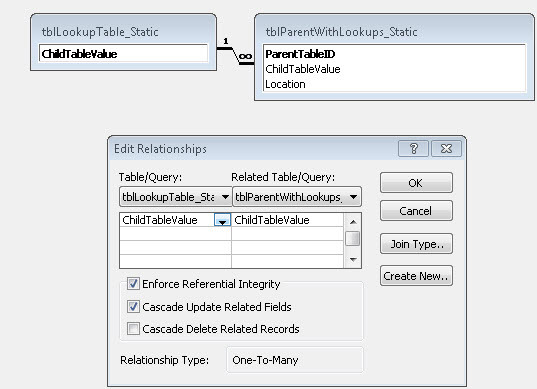 Back to lookup tables which have been infected with Lookup Fields. Different considerations apply to static and dynamic lookup tables. With a Static list, like Months, it's fine to dispense with the surrogate key. I've seen many tables like this that work just fine. Because it's static, you won't have to revisit the values in this table. 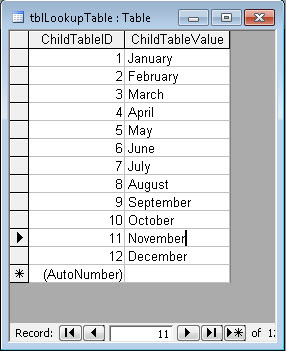 You can also count on any of these values stored as a related field in a different table being stable. Many developers follow this practice with static lookups, despite the prevalence of Surrogates (i.e AutoNumbers) as Primary Keys in most tables. With a Dynamic list, like Vendors, the issues are different. What happens, for example, if you misspell a name as "The Doctar Company" instead of "The Doctor Company". After a week of data entry someone finally notices the misspelling. By now there are multiple purchases made from the company. How hard is it going to be to correct the spelling mistake? 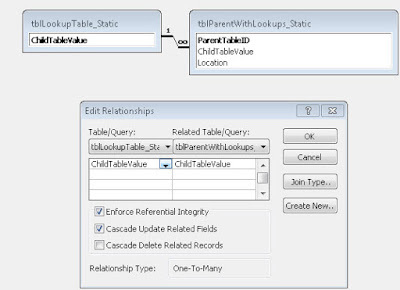 If your Vendors Lookup table is like the first example, of course, all of those related records were stored in the purchase table under a surrogate key, (i.e. the Primary Key of the Vendor table.) No problem, then, correct the Value field in the vendor table and you're done. The related records are not impacted at all. If your Vendors table is like the second example, it gets a bit stickier. 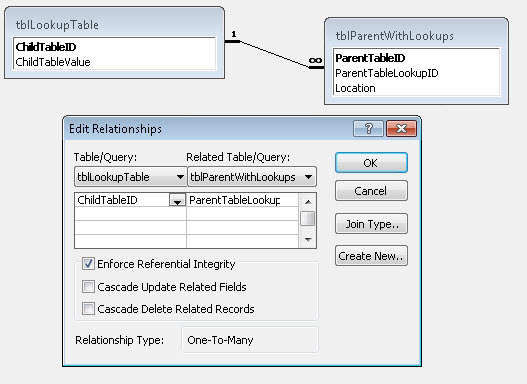 First, you may or may not have defined the parent-child relationship with Cascade Updates. If so, changing the spelling in the lookup table should cascade the correction to all of the related records child records. Quite doable and safe enough, if not really ideal. 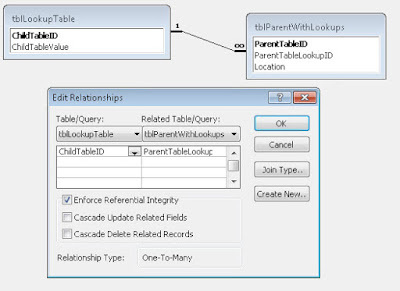 With that background on the basics of relationships and lookup tables, let's go back to the one in our original table. It looks like this in design view. And it looks like this in datasheet view. 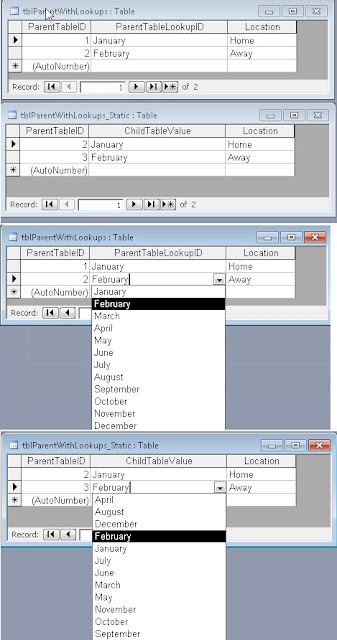 The Foreign Keys for the Month names are hidden and the user sees only the Month names. Many newcomers are pleased by this, but unaware of the trap they just laid for themselves. In fact, on the surface, there's no way to differentiate the two in datasheet view. Consider these four screenshots. It's not surprising then, that many times newcomers are confused when they try to work with such tables in their queries. "Why do I see the Names when I look at the table, but when I use them in a query, get the numbers instead?" So, now, here are some queries based on these tables. Access very helpfully includes the lookup field, hiding the fact that ParentTableLookupID is, in fact, a number. Not clear? Try this. Is it any wonder that so many newcomers flounder when they find that these sweet, sweet lookup fields in their tables are laden with hidden pitfalls? And it gets worse from here. I promise. Come back later for a followup on other problems I've seen.